It’s that time of year again. Hatch Chiles have begun arriving in stores. At least, here in Dallas they have started popping up. If you don’t know if stores in your area have them, try checking out Central Market or Whole Foods to start out with. Central Market goes crazy with them. You can find everything from tamales to crab cakes to sausage to hamburgers made with them. They put them in tortillas and marinades and dips and queso. You can even pick up some Hatch Chile Chocolate gelato (which I was a little disappointed in. I thought it would pack a bit more heat). If Central Market makes it, I can almost guarantee they have a version with Hatch in it right now. I’m not a big Hatch Chile snob. In fact, I’ve never cooked with them before. What little I do know about them boils down to this: Hatch Chiles are to the chile world what champagne is to sparkling wine. Let me explain a bit. All champagne is sparkling wine, but not all sparkling wine is champagne.You can make sparkling wine anywhere, but for it to be called champagne, it must be from Champagne, France. Same with these peppers. For them to be called Hatch Chiles, they must be grown in Hatch, New Mexico. Anywhere else, and they just aren’t Hatch Chiles. If they are grown in nearby Mesilla, then they are Mesilla chiles. Anaheim peppers? Taken from Hatch chile seeds and grown in Anaheim, Ca. So what’s the big deal about the Hatch valley? Some say its the volcanic soil. Some say its the climate, the hot days and cool nights. Does it really matter that much? I’m not sure, to me it sounds like one helluva marketing ploy. So why bother with them? Mrs. G loves Hatch chiles and quite honestly, I just got curious about them this year. I wanted to see what all the fuss was about. And at $0.99 a lb, why not? For my first use of Hatch chiles, I figured I’d start out with a simple salsa to get the feel…uh…I mean taste for them. 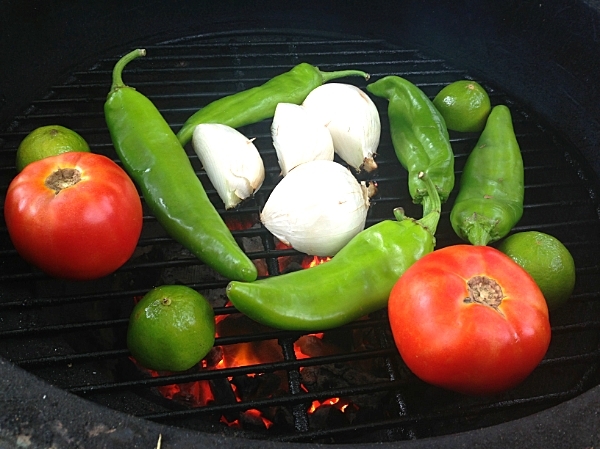 I’ve made plenty of salsas before by charring the veggies on the grill first. I thought this would give me an understanding of the taste and heat of the chiles I was dealing with before I moved on to more complex dishes. Roast the first five ingredients for 2-3 minutes, flip and continue the process until the vegetables are charred on all sides, roughly ten to fifteen minutes. For the limes, grill cut side down for 2-3 minutes if desired. Remove veggies from grill. Place chiles in a bowl and cover with plastic wrap. 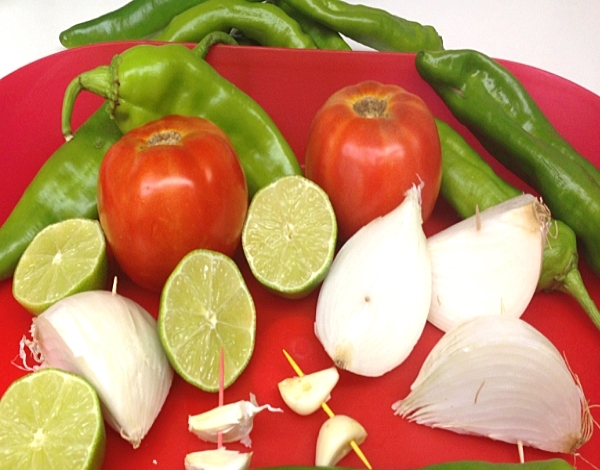 Remove the outer skin from the tomatoes, onions and garlic and toss in a food processor, as well as the cilantro. Squeeze the juice from one lime over the veggies. Once the chiles have cooled, remove the outer skin (it should peel right off). Cut off the stem end of the chiles and slice open one side. Open the chiles up so that they are laying flat and scrape out the veins and the seed (reserving the seeds if you like your salsa extra spicy). Toss the chiles into the food processor. Give the food processor a couple of quick pulses until it has reached your desired consistency. Taste and adjust seasonings by adding salt and pepper and/or more lime juice or cilantro. If it’s not spicy enough, add in some of the reserved seeds. 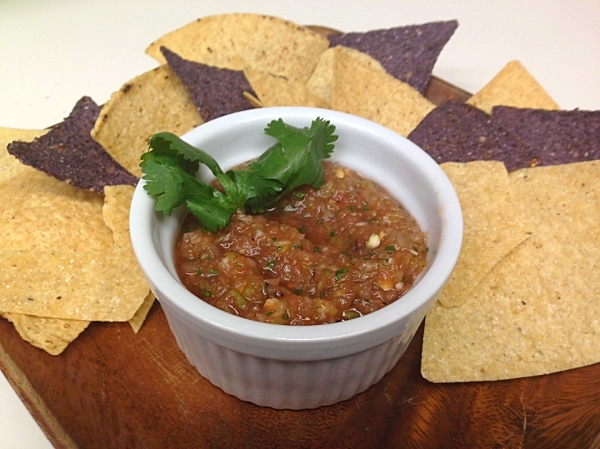 The salsa can be eaten warm, or chilled. The longer it sits, the more the flavors will marry and develop. 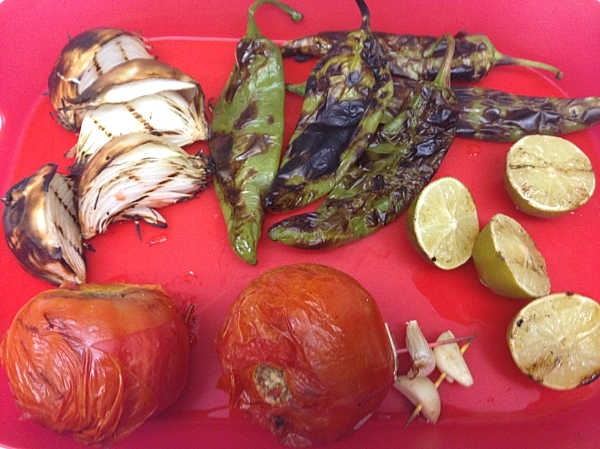 You may have noticed that the recipe calls for 3 Hatch Chiles and yet the pictures show I roasted 5. What’s up with that? I wasn’t quite sure what kind of punch these chiles would pack. 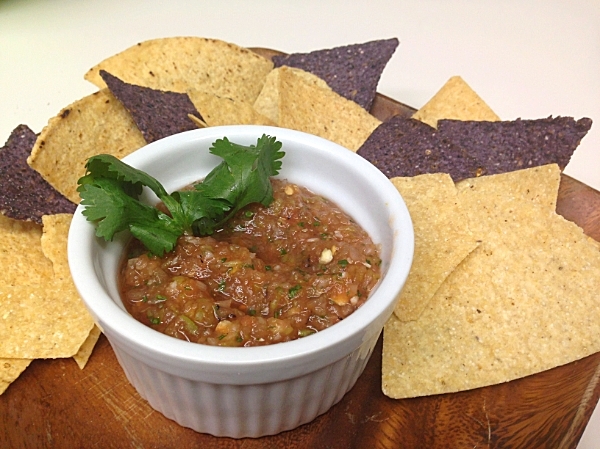 This is our basic recipe for salsa, but we usually use jalapenos or whatever other peppers we have on hand. Never having used Hatch Chiles, I had no idea how many it would take, so I erred on the side of caution and went ahead and roasted extra. Better to have too many than not enough (not to mention my research has indicated that the chiles freeze better if they are already roasted). So was it worth it? Is the hype and fuss all blown out of proportion? I’m still on the fence about that one. 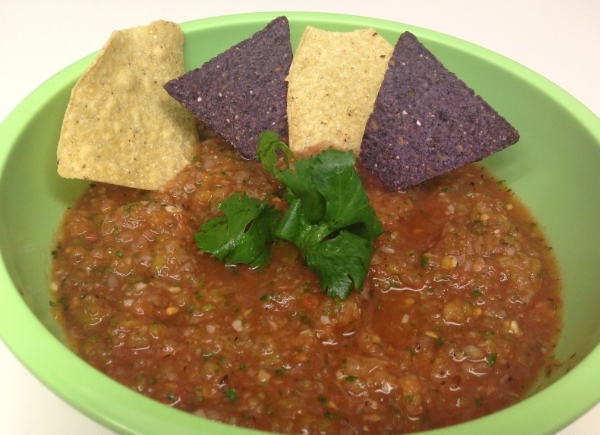 The salsa was chocked full of flavors and had a nice complexity. I’m a big fan of charring the veggies for my salsa, always have been. It adds another dimension of flavor, a nice underlying smokey taste, but not to strong to overwhelm the other flavors. The Hatch chiles, while not super hot, offered up a new and distinctive heat than what I am used to. It produced a burn in a different part of my mouth than say a jalapeno. There was no back of the throat burn, more of a front of the tongue. It was nowhere near as hot as a jalapeno either, nor did the heat linger around half as long. It was there, and then it was gone. It was actually quite nice. I think Hatch Chiles would make a nice substitute for those who like milder salsas. To evaluate the taste and heat of the Hatch Chiles, I’m not sure salsa was the best idea. With so many other flavors for it to compete with, I guess its kind of hard to pick out and isolate that one flavor by itself. But that is OK, because this was a great salsa by itself, as well as with the tacos we had that didn’t get pictured. It would be great on eggs or breakfast tacos or anything else you like to put salsa on. So are you a Hatch Chile fanatic? Do you go crazy over them in August? Do you roast them and stockpile them for the rest of the year? What’s your favorite Hatch Chile recipes? I’d love to hear about them. I will be putting up a Hatch Chile recipe round up Saturday – can I add this one? I would love to! It seems to be a seasonal item only available in August and Early September and it doesn’t ship everywhere. New Mexico and other neighboring states. Anaheim should work ok. I order directly from Hatch and I live in Florida. I have also had them shipped to Kentucky. I usually get the frozen chilies, but this year, I preordered fresh chilies to be delivered in September. Only Anaheims available here, but I think I’ll give this one a try with a couple jalapenos thrown in to bring up the heat. Sweet. Let me know how it turns out. Remember, you can always add heat, but you can’t take it out. Thanks for posting this Griffin! I stopped by one of the local markets (South MS) and was greeted by a big display of Hatch Chiles being sold @ 99¢ a pound. I had to grab a handful and will be making a salsa tomorrow probably. Very cool. That’s the same price we paid for them here although the flier in the newspaper had them marked at $2.49. 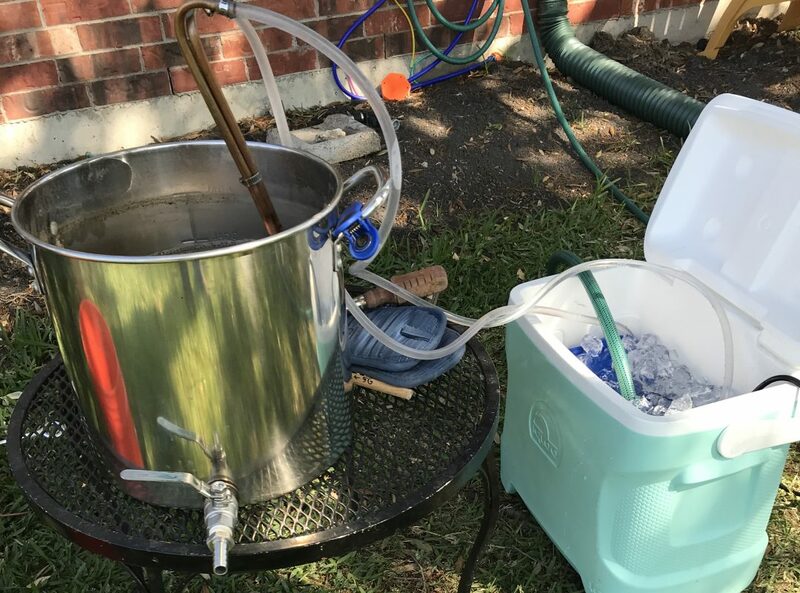 I should have another Hatch recipe on Monday if it works out. Going to try it tonight and I’m pretty excited. Looking forward to it! I was also thinking about doing a tri tip like pepper stout beef with some. The store had angus choice tri tip for $2.99 a pound, so I bought several packs, some steaks and a roast. Fixed the salsa just now.. While it’s got a nice flavor, it has nowhere near the full red color yours has. Hmmm…could be due to variances in size of tomatoes and peppers? Regardless of color, its the taste that really counts. Was it hot enough for you? I struggled getting all of the peppers to peel, so I left some out. Probably could have been hotter, but that’s on me, not the recipe. I was rushing to get it done so I could get to cooking the tri tip steaks I got before heading to our friends’ house. Hmmm, I didn’t have that problem. Maybe you didn’t cook them long enough? Did you cover them with plastic wrap and allow them to cool. That steaming process usually helps get the skin off peppers pretty good. I’m guessing I just didn’t cook them long enough, and my plastic wrap was all jacked up so I used foil. Probably didn’t cook the tomatoes long enough either. Oh well, I’ll take another stab at it. Hey! That’s my pingback up there – the round-up is up! Wonderful. Thank you for including me. Just wish I had been able to finish up my Hatch Chile Lime Wings in time. We don’t get real Hatch chiles East of the Mississippi very often. In fact, I’ve only had real ones twice. I usually get Anaheim chlies, they are always available but not the same. I wonder how different they are, Chris. I’d like to do a side by side comparison someday. I’m still not sure if its just a really good marketing ploy or if they are really that much better. Made this simply because these chiles arrived in my BountifulBasket this morning. It’s is the first I’ve ever had them. My neighbor is having a party and wanted salsa. This will be going to the party, but with a warning. He he he! I like the burn, and the flavor that follows. Went ahead and grilled all the pepper so I can make a repeat later. That’s awesome, Kelley. Glad you liked it. I just tried your recipe for Hatch Chili Salsa last night . . . a big hit. I think we’re neighbors. I live a few doors east of UTD. How can I get on the alert list for the next Dallas/Collin County Big Green Eggfest? East of UTD, you say? Wow, small world, we’re just south of UTD. We can probably smell the smoke from each others grills when we light them up. In the spring, there is usually one in Athens and Austin. Don’t know dates, never been. There is also one in Texarkana, but I haven’t heard anything about it this year. I’m going try this yummy recipe this weekend (I have 35 lb of roasted Hatch Chile in my freezer). I want to mention that Hatch Chile can be purchased in a variety of heat levels. If you buy at a grocery store, you will not know the heat level before tasting. I buy the extra hot from a CA importer of fresh Hatch Chile. It is SPICY (on the level of Serrano, but with a much richer flavor). They also offer mild, medium, hot and extra-extra hot. I hope you like it Snarf8. The store I went to only had them designated as mild or hot, unfortunately. I didn’t think the mild had any heat and the hot just a tad. I love fresh Hatch chiles! I usually purchase an entire bushel of them to roast, peel and freeze for the coming months. I love them. Sometimes I will purchase a bushel of mild or medium and some end up being closer to hot so I think that is one inconsistency that you should keep in mind. If you don’t roast them enough to get a good blackened skin then it is harder to peel them. I especially like them in meat stews or a layered “relleno” casserole as these are almost impossible to stuff like a regular chile relleno. There are terrific recipes out there and since I have so much product I like to try different ones. It was my first time using them, but won’t be the last for sure. Made sure to stock up, roast, peel and freeze a bunch to help get me through the year. Did you check out my Hatch Chile Pork Stew that I did?